Now accepting applications for CAUSE's leadership development fellowship for graduate students. Hey graduate students! If you're in Southern California, interested in public affairs, studying in the fields of political science, public policy or public administration, and looking for an opportunity to actively engage with the APA immigrant community, here's a great fellowship opportunity for you. 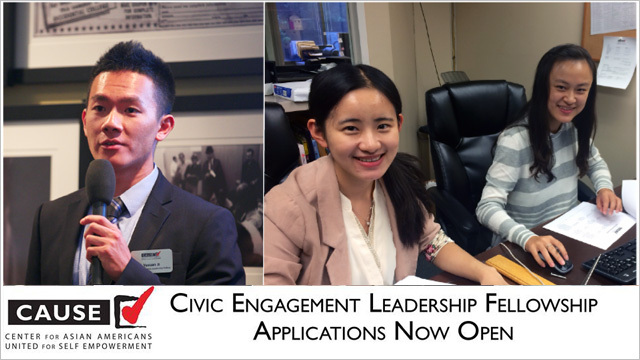 The Center for Asian Americans United for Self Empowerment is now accepting applications for the CAUSE Civic Engagement Leadership Fellowship (CELF), a leadership development fellowship program geared towards graduate students interested in becoming greater civic leaders for the benefit of the APA community. The CAUSE Civic Engagement Leadership Fellowship (CELF) is a leadership development fellowship program geared towards graduate students interested in becoming greater civic leaders for the benefit of the APA community. The CELF program was specifically designed in order to address the need to bridge the gap between local government and APA immigrant communities. In this highly intensive fellowship program, fellows are trained to reach out and actively engage APA immigrant citizens by providing an in-language education on the importance of public policy discussion and civic participation through providing increased voter education and outreach services as well as a greater access to local government. This year's class will focus on improving services for the recent Chinese immigrant community. Participating fellows are provided with opportunities to acquire valuable professional skills and build vital social networks that will enhance participants' careers and their effectiveness as community leaders. Applications are due by Friday, October 2. For further information about the fellowship, including student qualifications, required application materials and details about the selection process, visit the CAUSE website.